The legendary assassins are back and totally upgraded! As the fifth game in the series Ubisoft has really out done themselves with Assassin’s Creed 3 by finally revealing the end game of the “Templars” and as any fan of the series will see, the developers have taken all the best parts of the previous games and placed them in this one! Interestingly enough, this game introduces us to a new assassin. We follow Connor in his life’s journey in becoming an assassin! Not to spoil it for the fans of the series but there were a few “Oh damn, I didn’t see that coming” moments throughout the game. 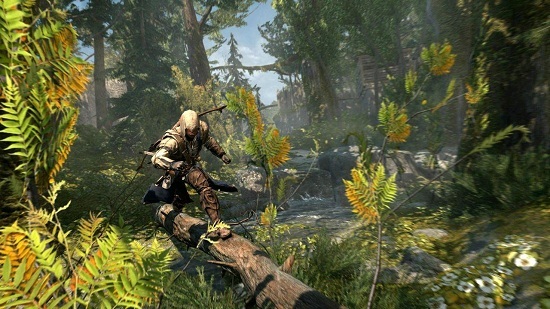 I have always been a fan of free roam role playing games and in AC3 being able to climb rock faces and trapeze from tree to tree will have you exploring the enormous maps available to you in the game! The fact that you literally go into the wild to hunt for animals helps you hone in on your ability to hunt without being seen! Laying down snares to catch raccoons and rabbits for their fur which you, in turn, can sell to earn an income is a new feature that hasn’t been seen in the series before. Another new feature is constantly changing environment; day becomes night, rain and snow for the changes in seasons, all giving gamers a unique experience! Running on a flat surface may be easy but moving through snow or shallow water will change your pace and the way you move through it. While hunting animals in the wild if you don’t get a clean kill you will wound the animal allowing it to escape but being a man with extra ordinary skills, you can even track the wounded animal from the blood trail it leave during its escape, even being able to back track in snow was amazing to experience. One thing I have been suspecting in the previous games and was hoping to feature in AC3 was being able to use all your skills as the assassin in the modern day time and yes even this was put in by the developers! 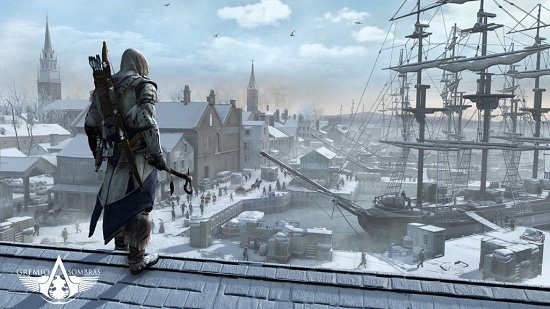 Leaving the animus Desmond can complete tasks to help the team, collect artifacts and exploring buildings and skyscrapers .I would have liked to have had more time exploring entire cities as Desmond but I’m sure there will be an Assassins creed 4 in development , well at least I hope so. Battles weren’t only won on land; in AC3 you venture out to the open seas to battle other ships in some historical battles! Meeting people and helping those in distress unlocks mini missions which also provides you with allies who you, as Connor can call, on at anytime when you need a hand in a battle or if you need a distraction or even to set traps and ambush those invading British forces! In helping people you build a community that can actually build and create objects to sell as well as my favorite, they create equipment for Connor to use and even improve other weapons that you already have. This game looks amazing and the characters movements are smooth and realistic! Gameplay and story is deep and rich in historical facts and characters as in all previous entries to the series! The ability to go anywhere and hunt everything will really have you engaged in exploring every nook, cranny and dark spot on the map! 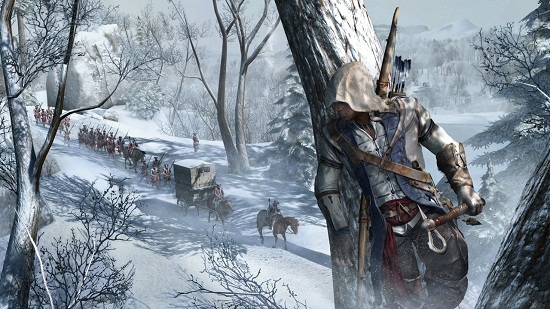 Assassin’s Creed 3 is a most impressive game and a must have, whether you are a fan or not.